The GNSS reference frame station, CHPI, in Cachoeira Paulista, Brazil, is operated by the Instituto Nacional de Pesquisas Espaciais (INPE) in conjunction with the Jet Propulsion Laboratory (JPL) and UNAVCO. The purpose of this trip was to upgrade communication methods used for data retrieval. The station is located approximately two hours away from the INPE main campus, which is where the previous download computer resided and operated. The data from the station was previously downloaded via a US Robotics Courier Phone modem at 9600k baud on an hourly basis. The work recently performed on this trip included the installation of a wireless ethernet bridge which now connects a newly installed mini pc directly to the internet at the station. The Ashtech MicroZ streams one second data to JPL, and in addition, the Ashtech MicroZ receiver was also configured to stream BINEX data which is then fed into the NtripServer running on the local computer. The BINEX data is sent to an NtripCaster which was installed at the INPE main campus. A third computer was also installed and configured to be an NtripClient for local collection of the BINEX stream and to provide RINEX files to local users. 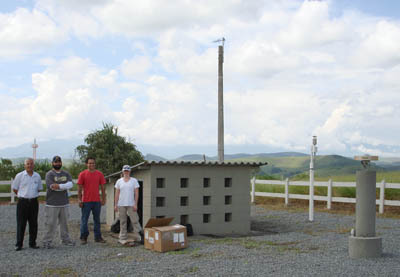 Figure 1 - UNAVCO engineers and INPE personnel at GGN-CHPI GNSS reference frame station.